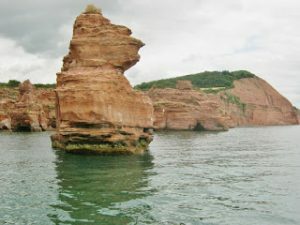 Thirteen members joined a Stuart Line cruise at 11.00 am on a warm, sunny day with a calm sea and enjoyed sailing from Exmouth to a turning point off Ladram Bay and back. Outbound we sailed some distance off-shore and gained a good general impression of the brown, iron-bearing cliffs of this part of the Jurassic Coast and their layered formation. On the way back we sailed as close as possible to the shore and saw details of eroded cliffs, caves and sea-stacks. The commentary given by a crew member was informative and just sufficiently detailed without being overwhelming and continuous. 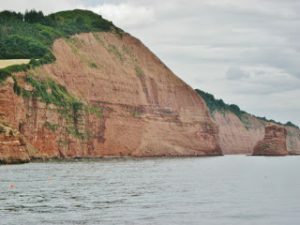 We were given a brief history of the formation of the cliffs and an explanation of the characteristics of the Triassic, Jurassic and Cretaceous layers. Some of us sampled a delicious Devon cream tea on board (cream, then jam on top!). After exactly two and a half hours (just as it said in the brochure) we returned to the Quay at the end of a most enjoyable trip.